An important and singular figure in the postwar Korean avant-garde, Seung-taek Lee has pushed the boundaries of art, object, performance, and materials since the 1950s. Born in North Korea, Lee began his career in the arts working on massive communist monuments, learning the craft that he would later use when he moved south and attended university in Seoul. 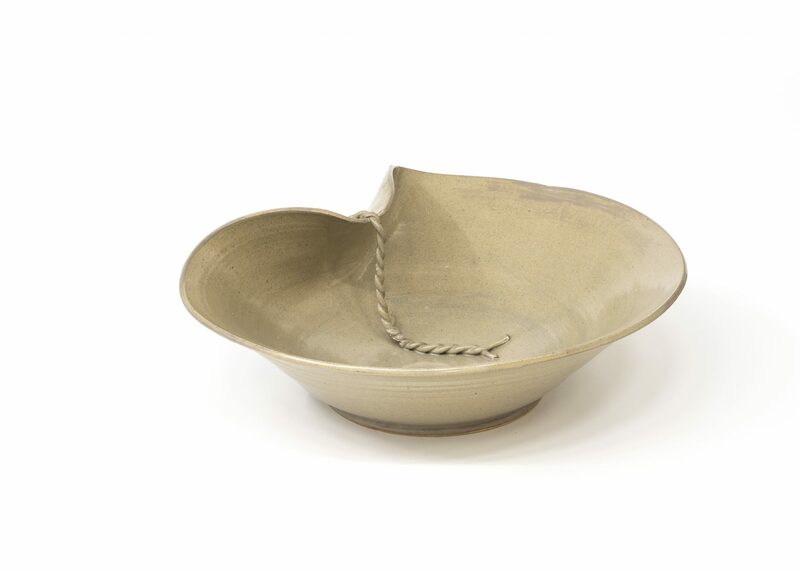 Inspired by the work of Giacometti, Lee experimented with familiar forms — folk art sculptures, stones used in weaving, and domestic earthenware vessels — reinterpreting the objects into what he would describe as “anti-concept” and “non-sculpture.” In this folded version of the Korean vessels known as onggi, two thin strands of clay act as rope, traveling across the rim and warping the bowl’s edge. Like his series of bound stones that appear to implausibly succumb to the force of string or wire, this piece makes the viewer question the solidity of the material and reality.